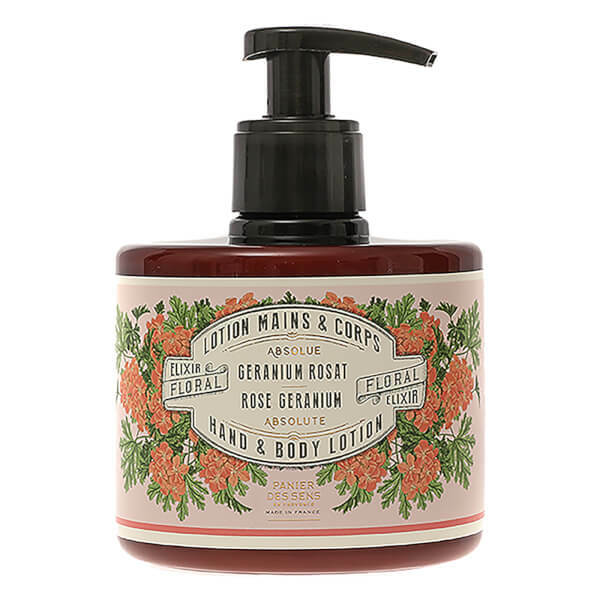 Rejuvenate your skin and senses with The Absolutes Rose Geranium Hand & Body Lotion from Panier des Sens. Enriched with a nourishing blend of Olive, Grape Seed and Avocado Oils, the lightweight cream absorbs quickly to soften and condition skin, without greasy residue. 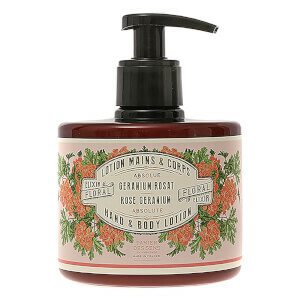 The hands and body feel smooth and replenished with a delicate floral fragrance. Housed in a convenient pump bottle for mess-free application. 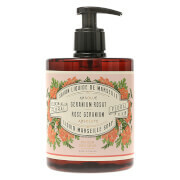 Apply a small amount to clean, dry skin and massage until absorbed. Aqua (Water), Butyrospermum Parkii (Shea) Butter, Glyceryl Stearate, Olea Europaea (Olive) Fruit Oil, Vitis Vinifera (Grape) Seed Oil, Parfum (Fragrance), Pelargonium Graveolens Extract, Glycerin, Helianthus Annuus (Sunflower) Seed Oil, Ceteareth-12, Ceteareth-20, Tocopherol, Allantoin, Persea Gratissima (Avocado) Oil, Cetearyl Alcohol, Cetyl Palmitate, Dehydroacetic Acid, Ethylhexylglycerin, Carbomer, Sodium Hydroxide, Tetrasodium Glutamate Diacetate, Alpha-Isomethyl Ionone, Benzyl Alcohol, Benzyl Salicylate, Citronellol, Geraniol, Limonene, Linalool.